No one wants to think about death or insurance… until it’s too late. When you bought your home it was a mad rush to get your insurance in place in time to close escrow. Did you shop around? Did you ask about options? Did you just look for the cheapest rate? 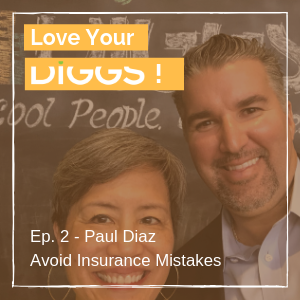 Paul Diaz is a second generation insurance broker and he has protected my families assets for years. He has seen every mistake in the book and I thought he was the perfect guy to drop some wisdom and help my Tribe. If you have someone that comes into your home to work (i.e. babysitter, housekeeper, gardener) you need to have coverage in the event that they get hurt and sue you. Document your belongings by taking a video while walking through each room and showing everything. Back up that video on the cloud, upload it to a private YouTube channel or if you are really old fashioned store a copy in a safety deposit box. The policy you got when you bought your house may not be enough. Lenders want to make sure that your house is covered, they don’t care if your stuff is.